SIP trunking is a standards-based replacement for traditional telephone lines. It connects your phone system to the telephone network via the internet. SIP trunks offer a more flexible and lower cost alternative to ISDN for inbound and outbound voice calls. 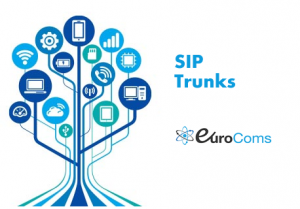 Why SIP Trunking From Eurocoms? For more information on Eurocoms and our SIP trunk solutions, please call sales on 0800 009 6776, alternatively please complete the form below. You may also be interested in viewing our Why SIP Trunking Guide (PDF).